The majority of the over 600,000 Chronic Kidney Disease patients conducting Dialysis have an AV Fistula to conduct their treatments. The Fistula is a patient's lifeline and most conducting Dialysis are very diligent about regularly monitoring their AV Fistulas, but they often overlook the following signs of AV Fistula dysfunction which may be causing poorer treatments and lead to shock AV Fistula Failure. In order to check your Fistula, you need to look to be sure there are no signs of infection (redness or discoloration); listen for the Bruit (buzz or swishing sound in your arm); and feel your AV Fistula Access to be sure that the Thrill (vibration) is still there and consistent. 1.) Inconsistent Bruit - Most patients realize if they do not hear their Bruit when they place their ear or stethoscope on your access site could mean that your access has failed or is severely blocked. However, you may be able to potentially catch a blockage sooner when you listen to your Dialysis Access, if your Fistula Buzz does not make a consistent swishing sound. If your Fistula is inconsistent, it could be a sign that something is wrong. 2.) Change in Thrill – A change in a Dialysis Patient's Thrill (vibration you feel when you place your hand over your AV Access), is an early sign that your access may be malfunctioning. Just like the Bruit, when there’s a change in the Thrill, it’s time to contact your Healthcare Team or Nephrologist. What's more, not being able to feel any thrill may indicate that your access has clotted. If you cannot feel a thrill when you place your hand over your access site, contact your Healthcare Team immediately. 3.) 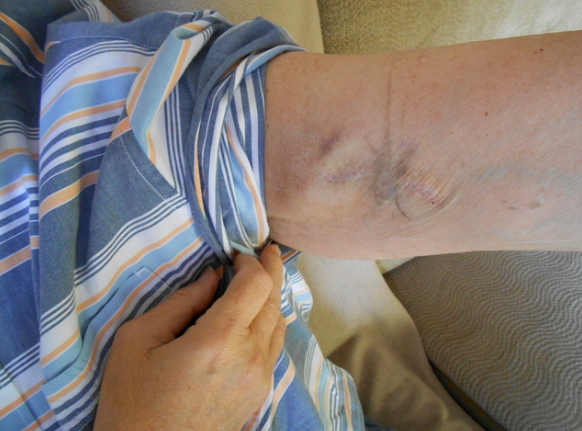 Infection – Dialysis patients with a Fistula or Graft may consider always wearing their Dialysis Arm Sleeve to avoid serious life-threatening infections. Early signs of infection include fever, swelling, redness, and warmth near your access site, as well as drainage, or pus anywhere along your access arm, catheter or needle site. This should be reported to your Nephrologist immediately and may even require an Emergency Room visit. Some patients say, "I have had my Fistula for at least 10-years and I take good care of it so I am not worried about an infection." Most patients take care of their Fistulas since it is their lifelines - that is typically not a unique factor. 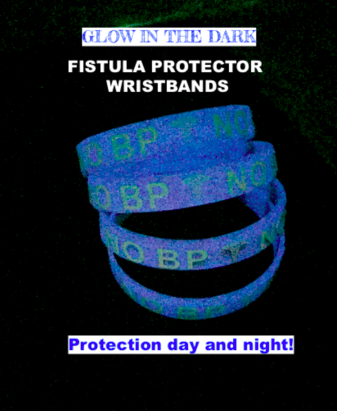 However, with the growing number of infections that are causing aneurysms, bloodstream infections, Sepsis, MRSA, and even death, patients should wear their Dialysis Arm Sleeves to help limit the risk of acquiring a Fistula Infection (click here). 4.) Numbness, tingling or cold arm and hand – If your hand or arm on the side with the access starts to feel numb or cold or begins to tingle, poor circulation to your hand could be the problem. If you experience these symptoms, you should call your dialysis team or doctor to let them know. 5.) Bleeding – Bleeding from your access site after your hemodialysis treatment is normal, but should only last for about 15-20 minutes. Bleeding for a longer period of time may be an early sign that you may have a stenosis (narrowing) in your fistula or graft. This is something you should bring to the attention of your dialysis team. Place a clean gauze pad over your access site and apply gentle pressure. If the bleeding doesn’t stop after about 15 minutes, you should call your doctor right away. If you have a catheter and notice bleeding, you need to go to an emergency room immediately. 6.) Arm or hand swelling – A swollen arm or hand is something to take note of. If you have swelling without redness, drainage or warmth, chances are you do not have an infection. Swelling can also be caused by edema, or fluid retention, which is common in dialysis patients. However, if edema is the problem, your other hand and arm, and possibly your legs and feet, would also likely be swollen. Swelling in your arm and hand on your access side may signal that a more serious complication is brewing. Typically, AV Fistula complications are less devastating if caught early. Hence, if something has changed with your access, you should always talk with your Nephrologist or a member of your Healthcare Team since even small changes to your AV Access could be a sign of a big problem. How do you try to protect your Dialysis Arm? Have you ordered your Dialysis Arm Sleeve yet or are you using another Fistula Cover? Weigh-in with your own pros and cons at the KidneyBuzz.com Facebook Fan Page which has over 72,000 friends (click here). While you are there, like the KidneyBuzz.com Facebook Fan Page and visit KidneyBuzz.com regularly (approximately 250,000 monthly viewers) for the latest tailored breaking news and information which teaches those with Chronic Kidney Disease, on Dialysis, have Kidney Transplant, Diabetes, and High Blood Pressure how to better manage and improve their lives. You may become a regular visitor like, Tom Johnson who said, "Kidney Buzz is the best source of information for any patient that suffers from kidney disease. 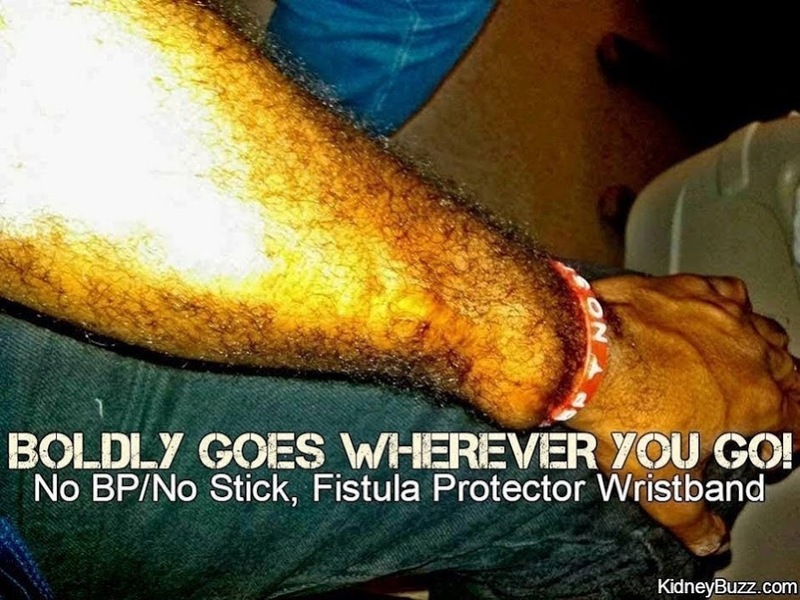 I'm happy that I found the advertisement for the Kidney Buzz warning bracelet that put me in touch. Thank you for all that you do."